A door flies open. Lightning flashes outside, and in from a violent storm steps our next author, LISA ALDRIGE! Lisa Aldridge lives in the Ozarks where magic happens every day. 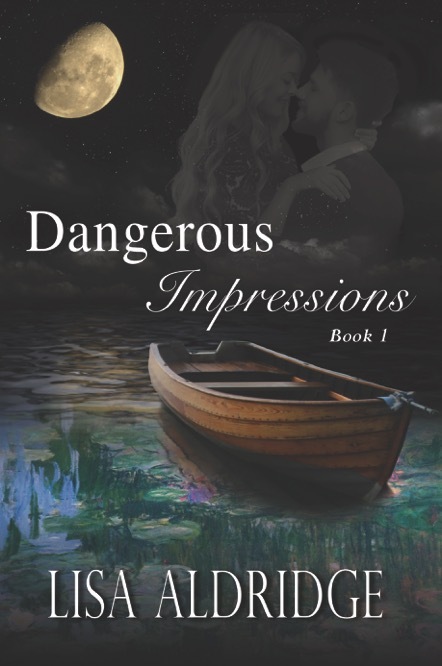 She is the author of Dangerous Impressions, the first book of The Dangerous Impressions Series for New Adults. 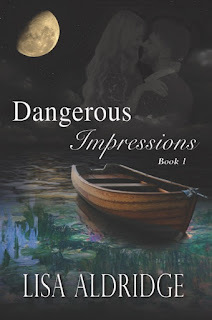 Her forthcoming novels include: Fiery Impressions, Book 2 of the Dangerous Impressions Series, The Knowing Ones (YA Fantasy), The Death and Rebirth of Maria Sanchez (Literary Fiction), and The Caregivers (short story collection). Before becoming a full-time writer, Lisa was a cultural anthropologist and spent a lot of time in dusty rooms with Native American effigy pots and skeletal remains that were thousands of years old. They whispered intriguing stories to her imagination. She also taught Sociology, History, and English college classes. But when she wrote a novel for her college students, she realized her passion for writing. 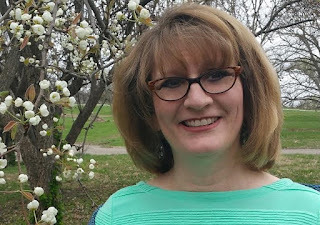 Lisa has an MFA from Lindenwood University and has published short stories, creative nonfiction, poetry, and flash fiction in various literary journals. She received the Samuel C. Dellinger Award from the University of Arkansas Anthropology Department and the Teaching in Excellence Award from Northern Oklahoma College. She loves hanging out with her poet-husband and her hilarious kids, she has eight of them! She also loves painting and dark chocolate. Someday she hopes to paint an edible landscape with melted chocolates. My favorite flavor is definitely chocolate. My second favorite flavor is chocolate-caramel. My third favorite flavor is chocolate-orange. My fourth favorite flavor is chocolate-dark chocolate. My fifth favorite flavor is chocolate-just about anything else! My fictional best friend changes, depending on what I’m writing or what I’m reading. Hermione Granger was my best friend once. Seriously, we did everything together. I even helped her in Potions class once when Snape wasn’t looking. I sort of have this understanding with cats, they love me. I get out my computer and ignore them and they are magnetically drawn to sit between me and the screen. It happens every time, without fail. I am a were-bunny but I only turn when the moon is orange. As captain of a space ship, my entire mission would be to have a library in space. It would be the quietest and most gravity free environment. Books would just float past and you could grab one. Also, snacks are allowed on the library in space. Think about it, freeze-dried ice cream. It would be named A Library In Earth’s Nethersphere. ALIEN for short. My life, and therefore my writing is a comedy. I live a reality sit-com. For example, one day while trying to write, my 95-year-old grandmother called and wanted me to take her to the store to buy cat food and cookies. She rode one of those electric carts and I had to run to keep up. When we got to the cat food aisle, she wanted everything from the top shelf. I had to read all the labels to her because her cat doesn’t like anything with liver in it. Well, that’s understandable, neither do I. But then, my grandmother wanted me to figure out how many calories were in each kind of cat food! Cat calories for a cat made of nothing but fur! Next, we went to the cookie aisle. She chose 8 different kinds of cookies. Did she ask for the calories in a single cookie? No, of course not. What do you want to be when you grow up? I want to be an international art thief, archaeologist, supernatural, healer, conjurer, artist, professor, dragon, and wizard.